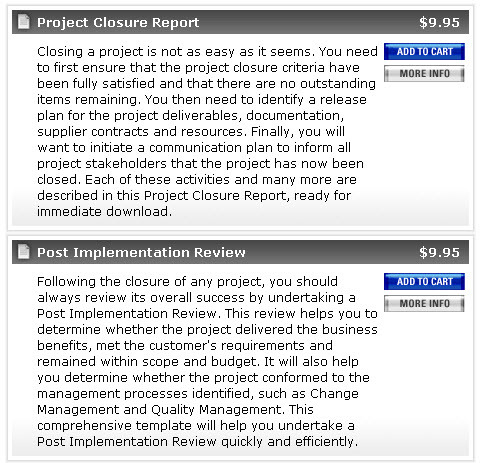 These Project Closure templates help you take the steps needed to close your project quickly and efficiently. The 'Project Closure Report' will help you handover the deliverables and documentation to the customer, terminate supplier contracts and release resources back to the business. The 'Post Implementation Review' will help you to determine the level of project success and identify lessons learned for future projects. Click Buy Now button to purchase your Project managment closure template or Buy Entire Project Management Kit, that includes all of these templates including execution templates and get FREE Project Management Study Guide! Use templates to deliver your project from start to finish, and by using closure template you can save time on project, download them today. Need help for Project Management Certification Test? Preparing for PMP Exam? We go yout covered it's easy? Visit our best review materials in the form of live courses practices tests and others for PMP certification exam. Compare Prices, select best study prep material for your exam test..
Are you a project manager looking for a tutoring job as independent tutor? Want to work directly with Tutoring Services, LLC as project manager trainer? Residing in the state of CT | NY or New Jersey Bergen County? And also happen to be project managers? Do you live in any of the following counties? Westchester, Bergen NJ, New Haven or Fairfield Connecticut? If so visit this link to view local job tutoring opportunities for Project Managers in these counties, directly from Tutoring Servies, LLC.